Play Age Of War 2 Online. The war between humans, orcs and elves continues. Command your units and destroy the enemy base while defending yours. 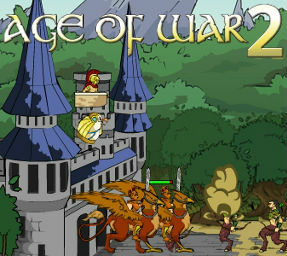 Age of War 2 is a combination of defense and strategy game. Main goal is to defend your territory and to destroy everything else! The second installment of this game is better than ever and many interesting things waiting for you to discover. Play Age of War 2 and have fun.